My selection of ten of the finest tourbillon watches presented in 2015. This is the skeletonized version of the Rotonde de Cartier Astrotourbillon, a watch that was presented in 2010. It is powered by the in-house Calibre 9451 MC movement in which the tourbillon has an elongated carriage that enables the balance to rotate around the dial, once a minute. The balance bridge is in the form of an arrow and so becomes a seconds hand. It is different from a normal tourbillon in which the two axes of rotation are close together and combined into a single unit, but the technical function of neutralizing the detrimental effect of gravity on the movement’s precision by constantly altering the position of the balance wheel axis remains the same. 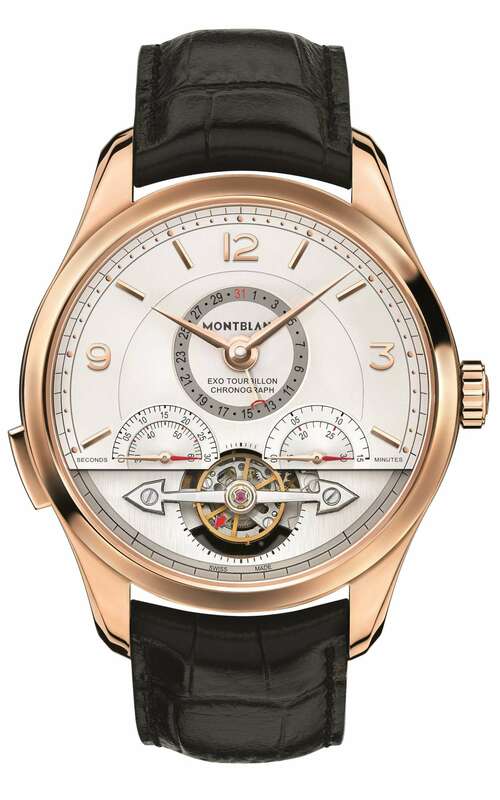 In this piece, the movement is suspended from the giant XII and VI numerals, and displayed by the sapphire crystal glasses on front and back of the watch. The only other link between the movement and the case is the bar at 3 o’clock bearing the Cartier logo that conceals the pin from the crown. The movement, in this case Calibre 9461 MC, is in German silver, with titanium used for the circular bridges on the back of the movement. Along with the white gold of the case, the result is an intriguing composition of silvery colours. The watch is a limited edition of 100 units in white gold, price about €120,000 plus tax. Read more here. The Ulysse Anchor Tourbillon is a remarkable watch incorporating bi-stable blade technology, the culmination of eight years’ research and development. While a normal escapement has a pallet fork mounted on a pivot, in this constant escapement tourbillon watch it is mounted on two blade springs whose geometry keeps them in a bistable state. The blade springs, made in silicon, are incredibly thin: less than a tenth of the thickness of a human hair. The pallet fork has been completely redesigned, and the geometry of this component, along with the escape wheel and balance wheel, is such that the energy that the balance wheel delivers to the pallet fork to kick it across is less than the energy that it receives from the two blade springs immediately after. So the balance wheel maintains a positive energy balance. This is one of the reasons why this tourbillon – notoriously a mechanism that absorbs a lot of energy – has a power reserve of at least seven days. Other reasons include the 18,000 vph (3 Hertz) balance speed, the two mainspring barrels, and the very light tourbillon cage. The 60-second tourbillon has a cage comprising 35 components but weighing just 0.4 grams. 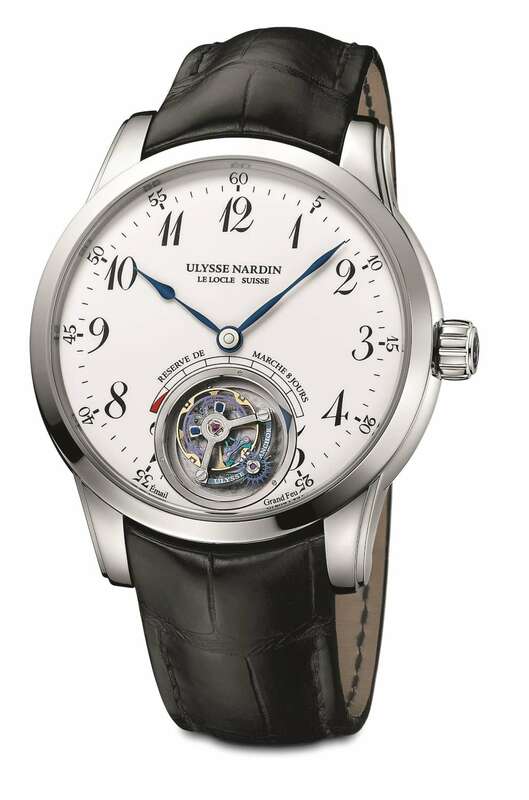 The power reserve is shown on a circular arc indicator around the opening for the tourbillon. The white gold version is a limited series of 18 pieces, each costing €88,000; the rose gold version is also an 18-piece limited edition, price €84,000. Read more here. This watch by De Bethune has a lot of the classic De Bethune features, in part because it is an anniversary piece, marking ten years from their first DBS made for the 2005 Only Watch charity auction. The new DBS Tourbillon retains some of the features of the original, such as the conical lower lugs, the hinged link between the top strap and the case, and the crown at 12 o’clock; the principal addition is the tourbillon. It’s an intriguing piece, and the more you look at it, the more you are drawn in to its tightly-nested series of circles like intersecting planetary orbits, with the blue orbs of the hour markers, the blued steel hands shooting out from the centre like blue comets or supersonic aircraft, and the glimpse of wheels deep down behind the skeletonized dial and deltoid-shaped movement bridges. The watch is a perfect illustration of what happens when watchmakers and designers coordinated by founders Denis Flageollet and David Zanetta are able to work on all components, making everything from scratch. They don’t have to make compromises, they don’t have to work with the limitations that you have if you are simply buying a movement and designing a case around it. They don’t want a date window? Perfect, and the watch benefits. Denis Flageollet believes that a tourbillon regulator for a wristwatch should run faster than for a pocket watch (for which Abraham-Louis Breguet invented the system) to better resist the jolts of the wrist, and so the tourbillon revolves twice a minute, with the regulator running at 36,000 vph (10 Hertz). This is achieved by making the tourbillon assembly very light, a total of just 0.18 grams for all the 63 parts – the lightest of which weighs in at under 0.0001 gram. Weight is kept low by the use of high-tech materials such as silicon and titanium. 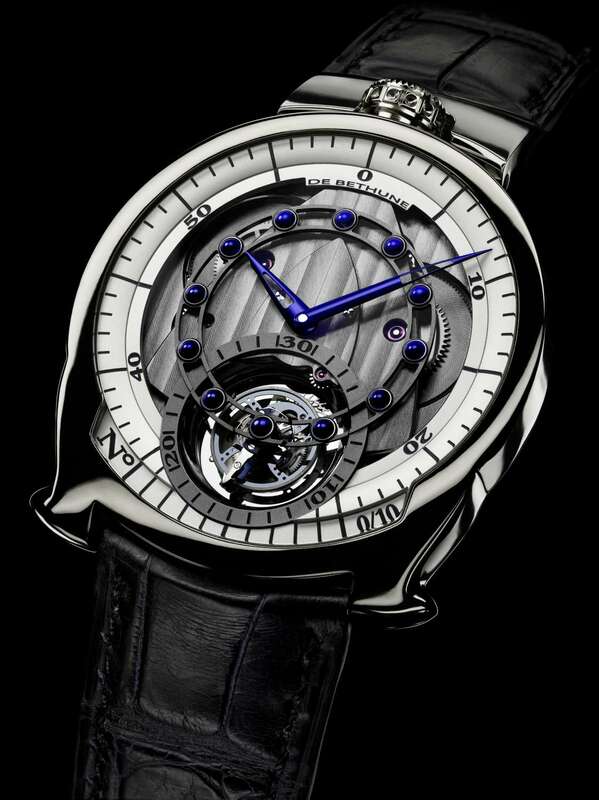 The De Bethune DBS Tourbillon is a limited edition of ten, price 195,000 Swiss francs. Read more here. This watch is intriguing, with its off-centred hour and minute hands, the absence of the usual dial markings, and the slewed figure-of-eight that encloses the automatic winding rotor and the tourbillon. But where Piaget are excelling in their latest watches is in the crystalline clarity of the engineering, and their ability to tell a story. Because after that initial first glance, a skeleton watch becomes an open book that invites detailed examination with a lens, and it’s then that it draws you in and fascinates you. 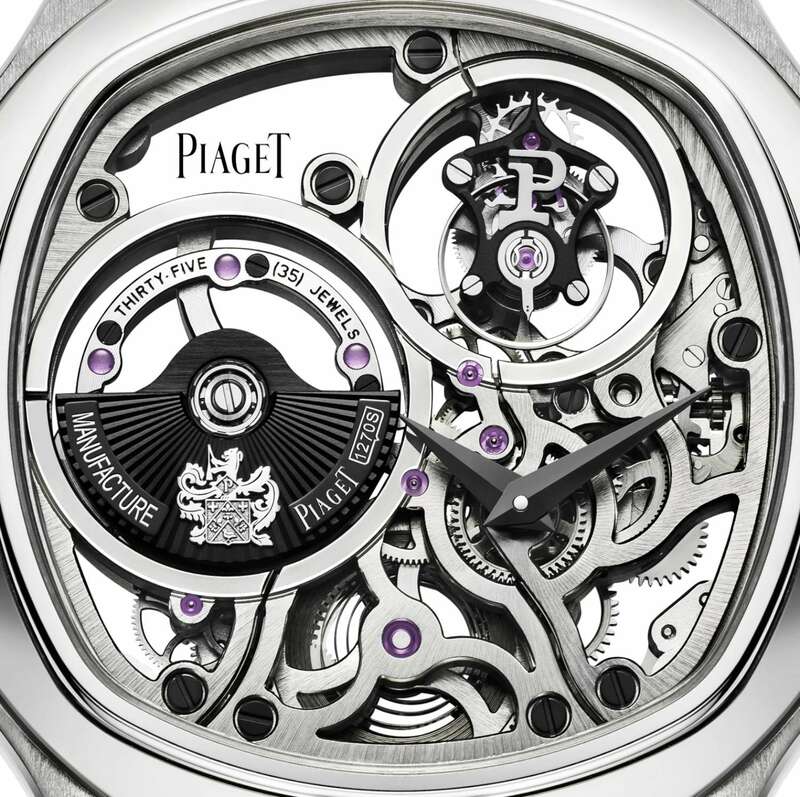 The story that it tells includes tiny details such as the Piaget crest on the oscillating weight, the P initial on the tourbillon, the company motto, Toujours faire mieux que necessaire (Always do better than is necessary) visible on the caseback side, and the architecture with the figure-of-eight motif alluding to the concept of infinity. Just the fact that the oscillating weight is clearly displayed on the dial side shows the attention paid to the display of time’s narrative, so that the watch is ever-changing both in the tourbillon’s continuous movement, the swinging weight, and the gear train that can be glimpsed from the front and is clearly visible through the caseback. In a way it continues the quest for transparency in engineering that could be seen in last year’s Piaget Altiplano 38 mm 900P. The case is just 8.85 mm thick, giving Piaget another ultra-thin record, this time for the thinnest skeleton automatic tourbillon watch. The watch is made in two versions, white gold (with black details), G0A40041, and pink gold, G0A40042; the case is large at 46.5 mm width. The watch has a black or brown alligator strap. Read more here. This watch looks a bit like a 1960s clock radio, with its long rectangular case, and the brand Angelus mentions, amongst its design inspirations, televisions by Richard Sapper and Marco Zanuso for Brionvega and record players designed by Dieter Rams for Braun. 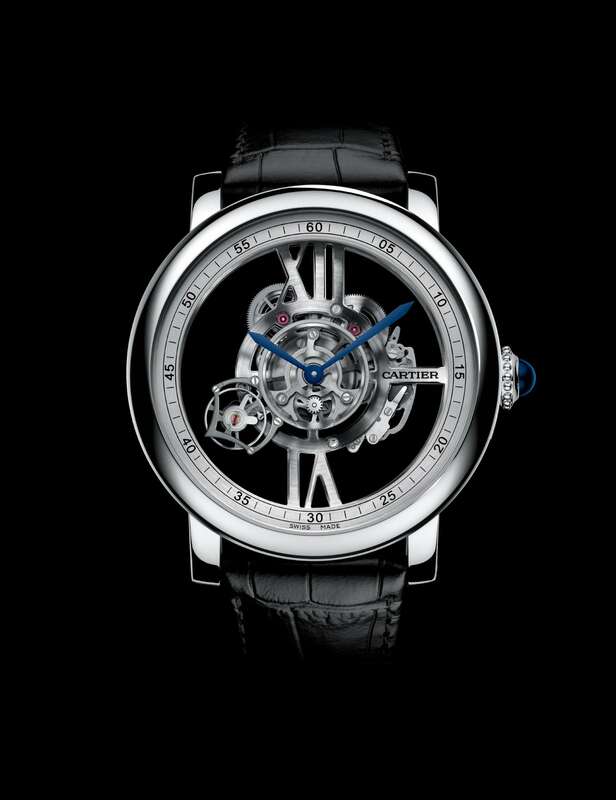 In this piece, a stainless steel case has seven sapphire glass windows, one of which is the watch glass for the time display on the left, while the other large sapphire on the right curves down over the side and provides a grandstand view of the tourbillon. The dial is shaped like a shallow pan, with very long second indices which highlight a feature of the movement: the dead beat (or true beat) seconds complication so that the second hand moves once a second, like a quartz clock. The second hand has a large circular counterweight which exactly frames the “A” logo at 6 o’clock when the second hand reaches 12. But all the attention is on the flying tourbillon, which can be viewed from 5 sides, through the main window, another on the caseback, and two smaller windows on the long sides of the watch. The tourbillon is separated from the rest of the movement, which is in the left-hand side of the case under the dial. 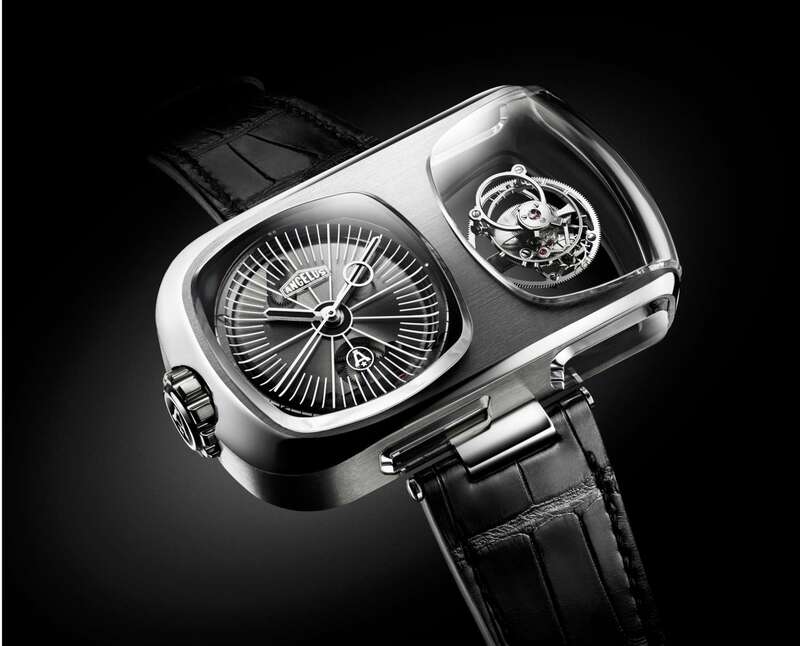 The tourbillon balance runs at 2.5 Hertz, 18,000 vph, and the tourbillon bridge is in titanium. On the lower caseband, there is a linear power reserve display: the watch is hand-wound and has a power reserve of 90 hours, provided by the two mainspring barrels that can be seen on the caseback. The Angelus U10 Tourbillon Lumière has a price tag of 100,000 Swiss francs (about €92,500), in a limited edition of 25 pieces. Read more here. This watch has a lot of traditional watchmaking features, but its open-dial design gives it a modern appearance. The design is cleverly laid out with perfect symmetry, revealing how energy flows from the first mainspring barrel (on the right) on to the second barrel on the left, down to the constant force unit at bottom left. This then releases energy at a constant rate to the tourbillon escapement at bottom right. 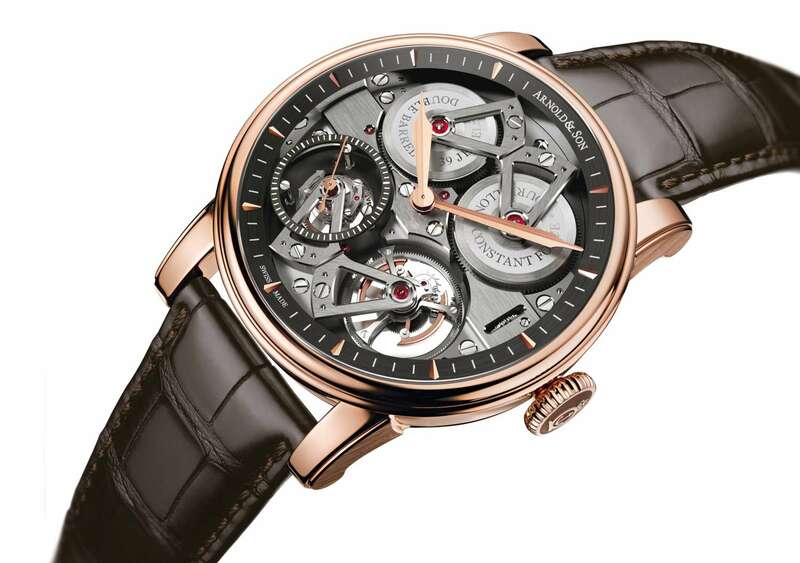 The theatrical, kinetic beauty of the piece is provided not only by the action of the tourbillon, but also by the constant force device which provides an indication of true beat seconds, with the second hand advancing one second at a time instead of the usual 3 or 4 Hertz continuous sweep. The openwork bridges are triangular, a typical characteristic of British antique watchmaking as performed by John Arnold. A similar reference to tradition, though translated into modern aesthetics, can be seen in the engraving on the barrel. The manually-wound A&S5119 movement is built in-house, with 39 jewels, running at 21,600 vph (3 Hertz), power reserve 90 hours. The Constant Force Tourbillon is a limited edition of 28 pieces. Each costs 188,892 Swiss francs (inclusive of tax), about €175,000. Read more here. 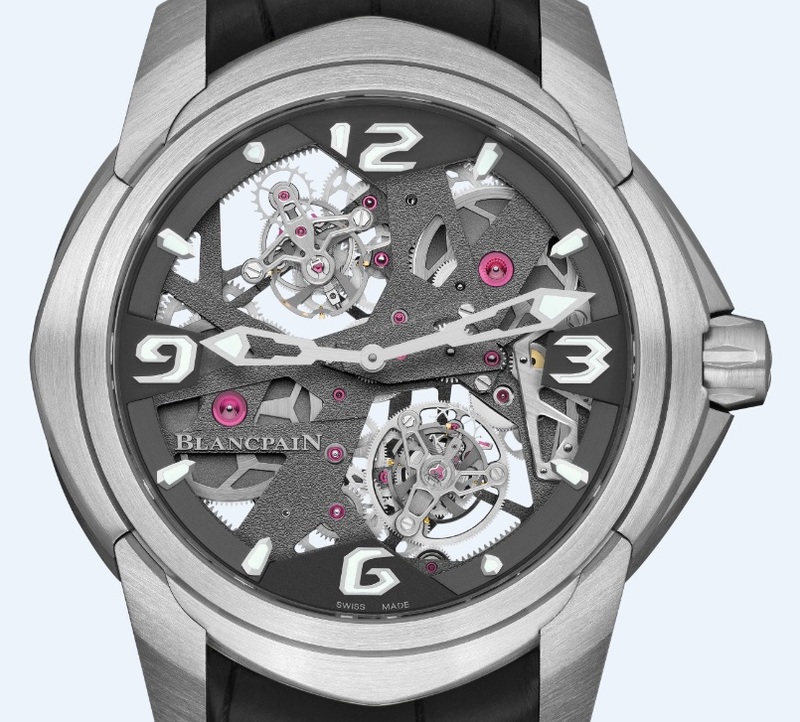 L-Evolution is the name that Blancpain gives to its most advanced models, with modular case construction and some unusual movement features. The Tourbillon Carrousel, with its calibre 2322V2 movement, has a modern and sporty look, but it’s not as glacial and frosty as it looks from the press-release renderings. When you have it on the wrist, it’s warm and engaging, and the sight of the tourbillon and carrousel working together make it a source of constant fascination. The case is complex in geometry and construction, the numerals are pure sci-fi, and the dial and movement are open-worked, giving the piece a great sense of depth. The screws are hexagonal and their slots create interesting, dynamic motifs. It’s interesting to look at both front and back. The carrousel, like the tourbillon, was designed to constantly vary the position of the escapement so that the variations in frequency caused by gravity would be evened out over time. In this watch the tourbillon and carrousel each have their own barrel, and both are wound simultaneously, with the crown driving a large wheel running right around the movement. You can see this through the sapphire caseback. The tourbillon’s and carrousel’s timing information is averaged out by a differential to pass the rate to the going train; the second differential is used to supply information to the power reserve indicator on the back of the watch. The movement is hand-wound, with 350 parts. It has a power reserve of 168 hours. Price £258,700. Read more here. This is a good example of Montblanc’s push to make complication watches more accessible. €38,000 sounds a lot, but for this sort of watch is an extraordinarily low price when compared to most tourbillons, particularly considering that it features the ExoTourbillon, a Montblanc exclusive rather different from the normal tourbillon, and a monopusher chronograph, with a movement that seems fundamentally in-house. The concept of the ExoTourbillon is that the balance is larger than normal, something that increases precision but also (perhaps more importantly) makes the watch more spectacular to observe. Normally a large balance would require an even larger tourbillon cage, but in the ExoTourbillon the cage sits under the balance on a two-point bearing. This saves weight and energy. The ExoTourbillon has another feature that would seem obvious in a complication designed to increase precision but that appears on just a few tourbillon watches (such as the Lange 1 Tourbillon Perpetual Calendar), namely a stop-second function so that the watch can be adjusted to the second. The chronograph is of the column-wheel type, and it is controlled with a monopusher. The two counters for chronograph seconds and minutes (60 seconds, 30 minutes) are semicircular, with hands of different lengths so that they correspond to the respective scales. The stepped dial gives the hands the space to clear the tourbillon bridge below. All together, this is truly an ingenious design solution that reduces the space taken up by the counters, maximising the space for the tourbillon. The date is shown on a circular central dial. Price €38,000. Read more here. Roger Dubuis’ aesthetic approach in this piece is somewhere between the arachnic and astronomic, with watchmaking director Gregory Bruttin referring to “the patient, meticulous and inventive nature of the work done by a resourceful arachnid as it daily spins its web in ever more novel and intricate patterns,” and a stand at SIHH 2015 that suggested dark and mysterious 3-dimensional structures floating in the blackness of outer space. “Astral” was the theme of the collection, also adopted by many other brands at SIHH, and the Excalibur Spider Skeleton Double Flying Tourbillon has something of a space station in its looks. The barrel bridge is constructed in a star shape, with four of the points joining the case in correspondence to hour markers. Below, the double tourbillons also have star-shaped bridges, visible through the sapphire caseback; each has a second indicator, and they counter-rotate, a quirky and engaging feature. They are linked to the gear train in such a way that their time-keeping is averaged out. The space-age look is heightened by high-tech materials such as titanium, red-anodized aluminium and black DLC coating, and in particular the red aluminium also introduces a hint of motor sports. The piece is large at 47 mm, and there is so much going on inside that you almost miss the hands, also skeletonized, with SuperLuminova at the tips to make telling the time easier. Its modernity contrasts pleasantly with the traditional, meticulously-worked finish, with all metal surfaces engine-turned, ensuring that the piece can be marked with the Geneva quality mark Poinçon de Genève, visible on both front and back of the movement between the tourbillons. The RD01SQ movement is spectacular from front and reverse, skeletonized to the extreme, so that you can see right through the watch. It was originally introduced in 2009; it is manually-wound, with a power reserve of 50 hours. 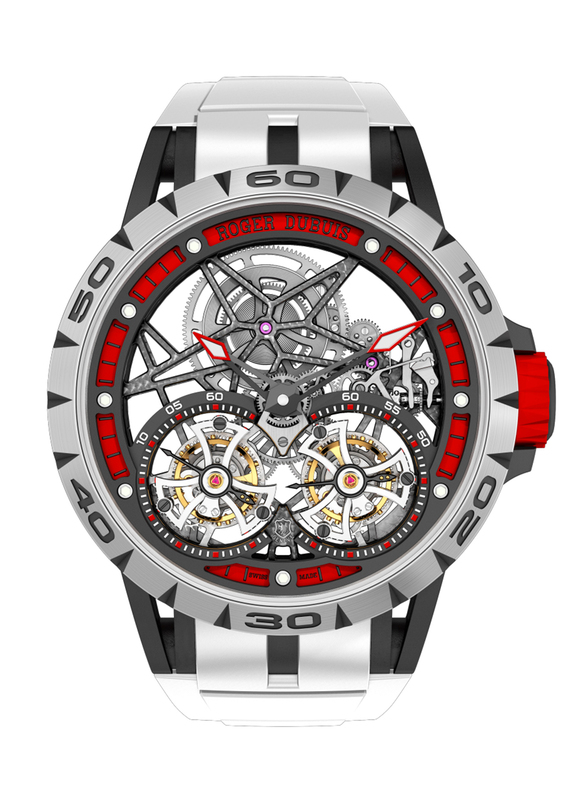 The price of the Excalibur Spider Skeleton Double Flying Tourbillon is still to be announced. It is a limited edition of 188 pieces. Read more here. 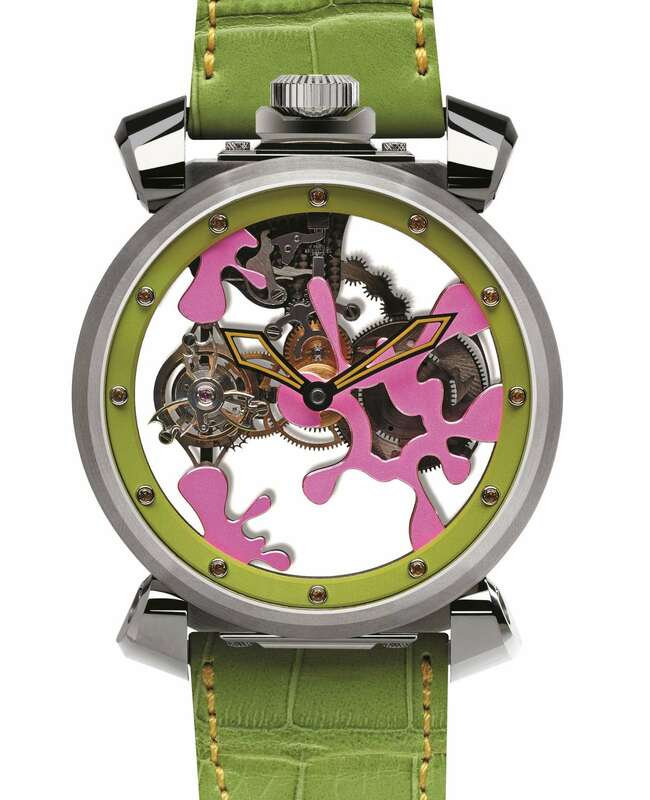 Romain Jerome does steampunk exceptionally well. The idea of steam-age machines that have gone far into the future, retaining all their romantic smoke, rust and brass produced an entire genre in art and movies, and in a way, mechanical watches are already steampunk in themselves, anachronistic survivors of a mechanical age in an electronic world. The Romain Jerome Steampunk Tourbillon is interesting to look at, with a hand-brushed bezel, a flying tourbillon at 6 o’clock with an anchor-shaped cage rotating once a minute, and a titanium piston at 9 o’clock which also runs in a one-minute cycle. The power reserve indicator on the right is designed like a steamship engine order telegraph, and the hour and minute hands have anchor-shaped tips with triangles of green-glowing SuperLuminova. The hand-wound tourbillon movement is the RJ200-TS calibre, made by Swiss company Concepto. 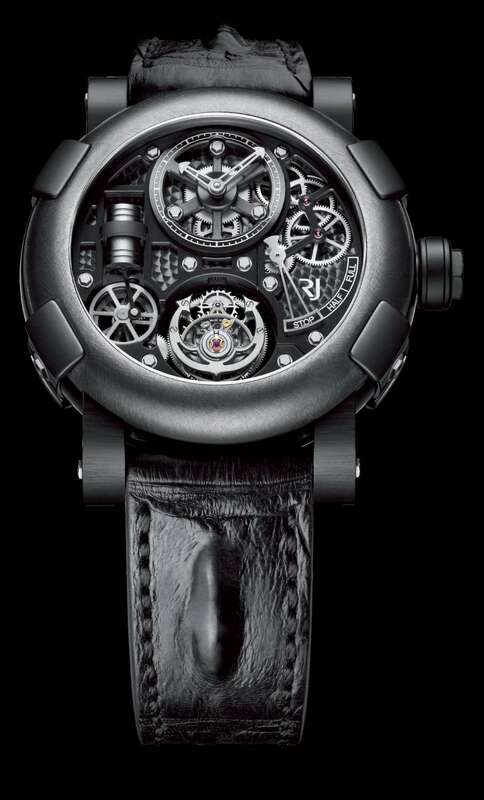 The Romain Jerome Steampunk Tourbillon is a limited edition of 25 pieces, price 82,000 Swiss francs, €89,950, US$ 99,950. Read more here. Quirky is immediately recognizable for its bridges that have been reconstructed into ink-blot-like shapes, and for its use of bright colour, from black to white, from fiery red to acid green, in four limited-edition versions (just twenty pieces). The case is in titanium, large at 47 mm diameter, 13.2 mm thick, with the crown at 12 o’clock (a characteristic of all GaGà Milano watches). The movement is the manually-wound Hysek calibre GG01 with 161 components and 17 rubies, running at 28,800 vph/4 Hertz, and it has a power reserve of 80 hours. 161 components is a fairly small number for a tourbillon, and likewise the power reserve is unusually high. It’s an interesting piece of engineering, with everything slung on a plate that is attached to the outer mainplate ring by only a few narrow pieces of metal. 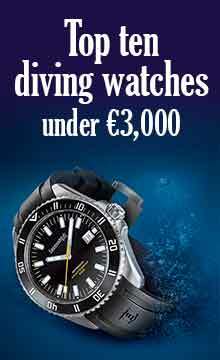 The watch costs €120,000. Read more here.